AU $308,900	Including Duty/GST Need Finance? AU $308,900	Including Duty/GST Need Finance? Need Insurance? Spacious good performing, spacious yacht, Germanisher Lloyds rating "A" for offshore cruising, light mahogany interior fitout, standard boat has 3 double cabin layout, H&C water, wired 240VAC and 12VDC, good easily worked galley with Corian benchtops, these boats are built to a high standard as denoted by the "A" class open ocean ratings and have proven to retain good resale values. Now priced from a low $298000 this is excellent value for money. 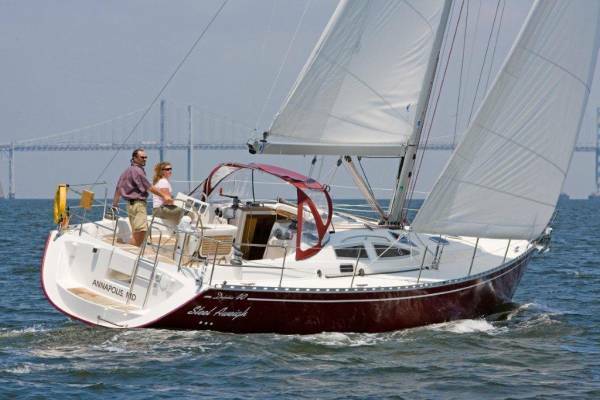 Prices are indicative of a standard equipped boat and are correct as at January 2015 but can vary with equipment changes and variations in currency exchange rates. Please ask for up to date pricing. Various keel configurations. 1.8m and 2.3m fixed keels, centreboard with twin rudders, single or twin wheel helms. 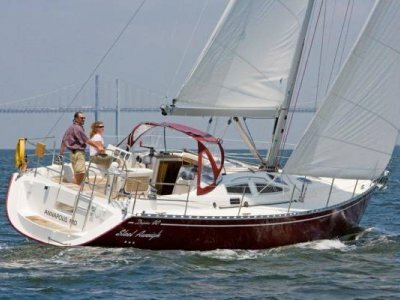 Thanks to 5 keel options, two to four bedrooms and various options to compliment the entry level trim, the Delphia 40-3 is an excellent choice for private, charter, or training purposes. With the two double cabin version, the L shaped galley is on port side with nav station and setee on starboard side. The 3 double cabin version has the nav station on port side and galley along starboard side of saloon. ........ 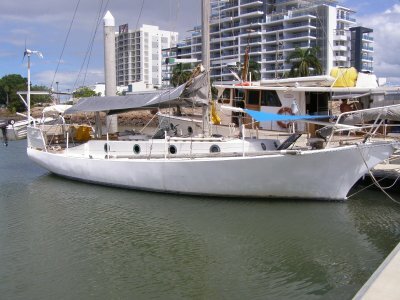 Many options available to build this boat to suit your own needs. Volvo 40HP diesel with saildrive with fixed two blade prop. Yanmar and Nanni diesels are optional as is shaft drive. Fixed or folding propellors available. Engine room: Well insulated engine room with removeable panels providing good access for routine servicing. Fire suppression built in to engine room. Wheel steering, single lever engine control, emergency tiller steering, Balanced rudder on solid 88m stainless shaft and roller bearings. King size double in forward cabin, queen size doubles in aft cabins, spacious saloon with warm light mahogany timbers featuring throughout. Other timbers available as an option. Nav station, hanging lockers, good natural light with 6 opening hatches in cabintop, 2.05m headroom in saloon, 1.95 in forward cabin. 3 double bed cabins is standard, and 2 or 4 cabin options available. Teak cockpit table with cup holders. Teak and holly styled straditional striped flooring throughout saloon. Hot and cold in 2 enclosed heads, plus cockpit shower, hot and cold. Wired 12VDC and 240VAC, 2 x 105AH gel house batteries, 1 x 75AH start battery. Leab battery charger. BEP master panel with circuit breakers, main switches and indicaters for fuel and water levels and volts. Fusion stereo with am/fm/vhf/ipod/usb, 2 speakers in saloon and two in cockpit. Simrad RS12 VHF transmitter with DSC. B&G triton speed/depth. B&G T7 touch screen gps/chartplotter. Any combination of electronics available as options. .
Furling genoa with uv protection strip, fully battenned main with MDS cars, single line reefing, boom bag and lazy jacks. 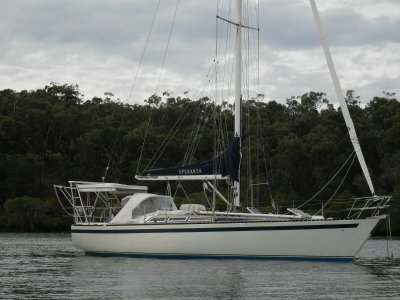 Seldon aluminium mast and boom, double spreader, 9/10's rigged, stainless standing rigging, all running rigging led back to cockpit via jammers and cabintop self tailing winches. Rodkicker boom vang, adjustable backstay tension. Self tailing sheet winches, self tailing cabintop winches and jammer banks on cabintop, 6 mooring cleats, teak laid cockpit and teak seats in stern rails. LPG gas cutoff solenoid and gas detector. 6 fenders and 4 mooring lines. Two of these 40's are currently sailing circumnavigations to Australia, the buyers having taken delivery ex factory. These are a stable, good performing responsive to the helm yacht equally at home cruising the world or club racing.